Working closely with Charlottesville, Va. architect, Robert Paxton, we created this antique heart pine kitchen as part of the restoration of Enniscorthy, one of Albemarle County Virginia’s most venerable estates. The matching breakfronts, to either side of the doorway, display glassware, provide additional storage, and conceal the television. The corner blocks, on the bases, are functional drawers. Architectural elements, consistent with the details of the house, were incorporated into the cabinetry design. 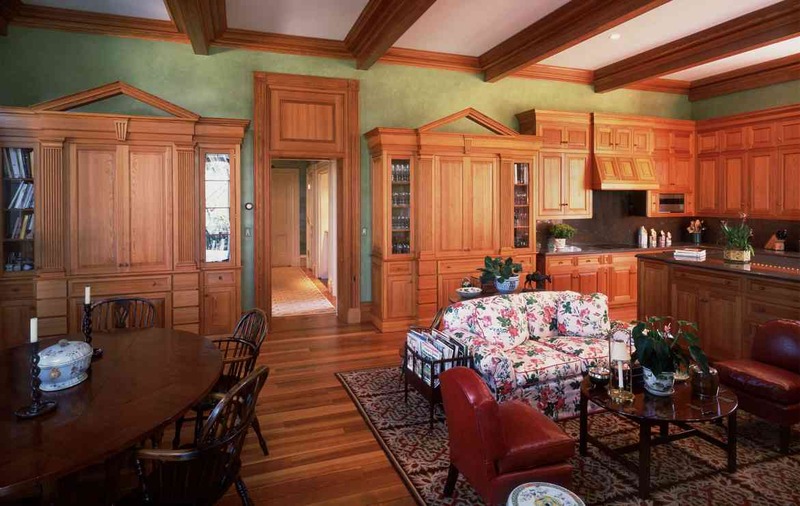 Our extensive experience with reclaimed lumber, such as this heart pine, along with our background in classical joinery and traditional, architectural forms, enabled us to participate fully in the evolution of such demanding designs. Jaeger & Ernst custom cabinetmakers welcome such challenges, and the opportunity to contribute to such magnificent spaces.